We are engaged in manufacturing, exporting and supplying a wide range of cardigans such as cotton cardigans. We are instrumental in providing to our valuable customers excellent quality Ladies Cardigans. We are leading manufacturer and exporter, bring forth for our clients superior quality Cotton Cardigans. While manufacturing these Cardigans, we take extra care of quality so our clients get best product. Our clients can avail these products from us at most competitive rates. We are mostly looking for Quires from UK, USA and European country's. Discover a great selection of cardigans for men in a variety of dress and casual fashions. A classic designs of cardigan sweaters for men from Elegance cut. 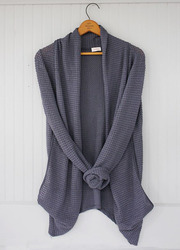 Full description:Soft cotton knit cardigan, contrasting striped finish, cropped sleeves and V-neck. 100% cotton, 40 degree machine wash, wash as wool. Pink cardigan featuring front buttons fastening, long sleeves, and ribbed detail at neckline, cuffs and hem.